Massachusetts yoga instructor Amy Barber was seeking to take her business to the next level with branding and website design from the ground up. We worked with Amy Barber to discover who her target market was, and how to best express identity as a yoga teacher and business. Amy Barber focuses on teaching her students a life with effort and ease which is best expressed through life lessons, and a blend of yoga pilates fusion. When discovering the brand of Amy Barber we focused on her inspirations from nature. As a teacher she is calm and grounded. Drawn to nature's elements we made them the foundational focus of her brand. We used the wood and greenery of trees, the soft warmness of dried grass, and focused on stones specifically jade tying in with the greenery in trees. 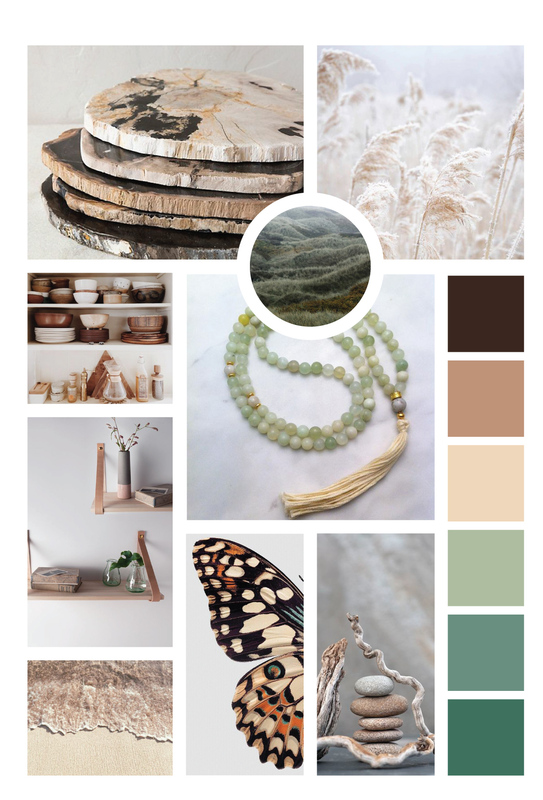 Her color palette reflects earth, stone, and sand. When it came to the finalization of the primary logo, a hand drawn rosemary leaf was used. Not only is it very tree like, but rosemary brings healing and mental clarity which is ultimately part of the mission for Amy Barber as an instructor. Her logo was also done with a clean and modern sans serif which suited her tastes and but also adapting modernism to ancient practices.